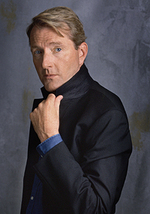 Lee Child has written the eleventh Jack Reacher novel, this one called Bad Luck and Trouble. Jack is a former special investigator for the Army, and here's why I love him: 1. He's really strong, 2. He's really brave, 3. He's a loner, 4. His only possession is a folding toothbrush, 5. When he buys a new shirt, he puts it on in the store and throws away the old one, 6. When he says he's gonna get revenge, you can count on it, 7. He's really good with numbers, so when he sees a bank deposit of $1,030, this is what he thinks: "Not prime, obviously, No even number greater than two could be prime. Square root? Clearly just a hair more than thirty-two. Cube root? A hair less than ten and a tenth. Factors? Not many..." Turns out that 10-30 is military police radio code for "needs urgent assistance." Jack's on top of it, of course. "LAX was a gigantic, sprawling mess. Like every airport Reacher had ever seen it was permanently half-finished. . . ."
"Even in such an upmarket joint, most of the first-floor real estate was devoted to slot machines. Patient, tireless, microprocessor-controlled, they skimmed a small but relentless percentage off the torrent of cash fed into them, twenty-four hours a day, seven days a week. Bells were ringing and beepers were sounding. Plenty of people were winning, but slightly more were losing." Confession: I like typing long quotes like this from authors I enjoy, because I can pretend I'm actually writing, rather than just typing. Pathetic, but it's what I got. . .
"Traffic on the Strip, distant rooftop condensers roaring, extractors humming, the muted rumble of a hundred thousand people playing hard. 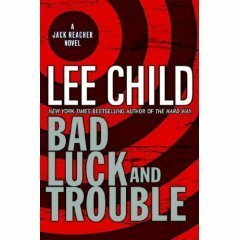 But Reacher heard the rack of the slide twenty feet behind him. He heard it very clearly. It was exactly the kind of sound he had trained himself never to miss. To his ears it was a complete complex split-second symphony, and every component registered precisely. The scrape of alloy on alloy, its metallic resonance partially damped by a fleshy palm and the ball of a thumb and the side of an index finger, the grateful expansion of a magazine spring, the smack of a brass-cased shell socketing home, the return of the slide. Those sounds took about a thrtieth of a second to reach his ears and he spent maybe another thirtieth of a second processing them."